That production date looks a bit odd to me. Reason being, mine is 0044888 and it was built in November 1983. Your chassis number is prior to mine and I'd expect it to be 10/83, not 10/88. It's got to be wrong because the model is being quoted as 1983 too. @Dai wrote: That production date looks a bit odd to me. Reason being, mine is 0044888 and it was built in November 1983. 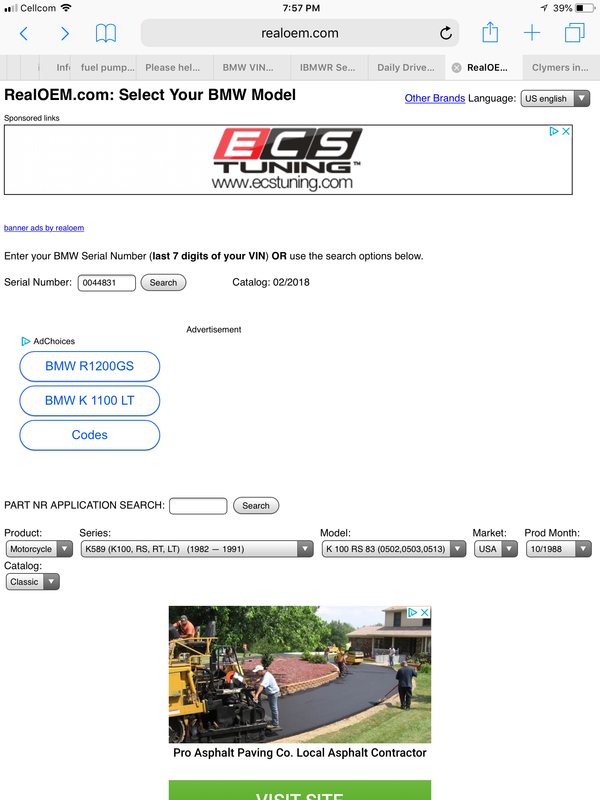 Your chassis number is prior to mine and I'd expect it to be 10/83, not 10/88. It's got to be wrong because the model is being quoted as 1983 too. 0044888 decodes to a build date of 10/88, not 1983. Here is the Real OEM picture. @duck wrote: 0044888 decodes to a build date of 10/88, not 1983. That will teach me to be to lazy to read the owner's document when it's only four feet from where I'm sitting. Try 04433 for mine instead... Apologies all round. 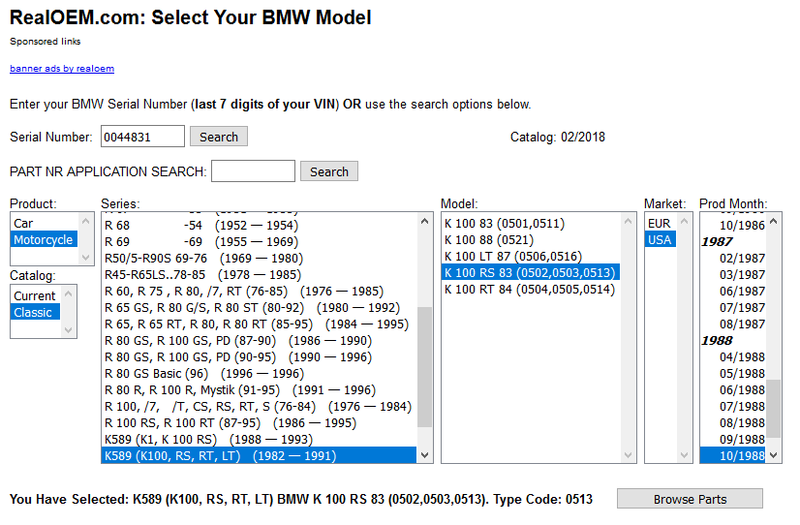 The VIN 0044831 should make it, in the USA at least, registerable as a 1989 model since BMW year/model production start is September of the previous year. As an aside as to how it's done from place to place, my red RS in OZ was built in 10/86 but Queensland Transport insist on calling it an '89 model because it was imported into OZ from Germany by the owner that year and 1989 is etched into the riveted on Qld VIN plate. @Two Wheels Better wrote: The VIN 0044831 should make it, in the USA at least, registerable as a 1989 model since BMW year/model production start is September of the previous year. » Hieroglyphics -- can you translate ''em?